Internet giants Facebook, YouTube and Google are dominating Asia’s mobile Internet market, according to browser maker Opera‘s most recent State of the Mobile report, which found that the services rank as the three most used by Opera Mobile users in more than half of the 25 Asian markets that the Norwegian firm tracks. Facebook itself is the undisputed leader, as may well be expected. The Menlo Park-based social network is the top destination for Opera Mobile users in no fewer than 16 Asian countries. That’s further incentive for the company to up its game on mobile and better monetise the channel in Asia and other emerging regions. Asia being Asia, and a hugely diverse continent at that, there are two stand-out examples to Opera’s trends: China and Japan. In the case of the former, this is hardly a surprise given that Facebook and YouTube are both blocked in the country, where newly merged Youku Tudou Inc is the largest video site (but not on Opera’s ranking list) and Google has had much publicised issues. Furthermore, Opera’s statistics for China are diluted by the presence of a strong local competitor. Though Opera doesn’t break out raw user statistics, its Chinese presence is likely cramped by home-grown rival UCWeb and its competing browsers. However, among the users that Opera does have in China, Baidu, Sina and Tencent-own messaging service QQ hold the top three spots. Sina Weibo — China’s Twitter equivalent — sits seventh and is the highest ranked social network. Things are somewhat different in Japan, where Google is top, ahead of popular Web portal Livedoor and Wikipedia. In a sign of the country’s 140 character obsession, Twitter ranks eighth ahead of Facebook. Despite making significant progress in Japan, after doubling its userbase in six months, Mark Zuckerberg’s social networking site is not included in Opera’s top ten list, yet. We know that smartphone sales are growing massively across Asia — with China becoming the world’s biggest market on shipment volumes and device activations — and Opera is riding that wave with its own impressive gains on smartphones. For comparison, use of the two browsers on all kinds of mobile devices (feature and dumb phones included) grew by an impressive 43 percent across its selected 25 countries in Asia. The benefit of smartphones over feature devices is more than just increased activity as the company is able to better monetise smartphone users with its ad-based system. That network was boosted in February when Opera acquired two mobile ad providers for a combined $64.5 million. 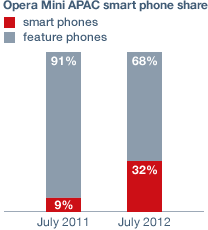 When it comes to measuring mobile Internet usage there are few better than Opera. 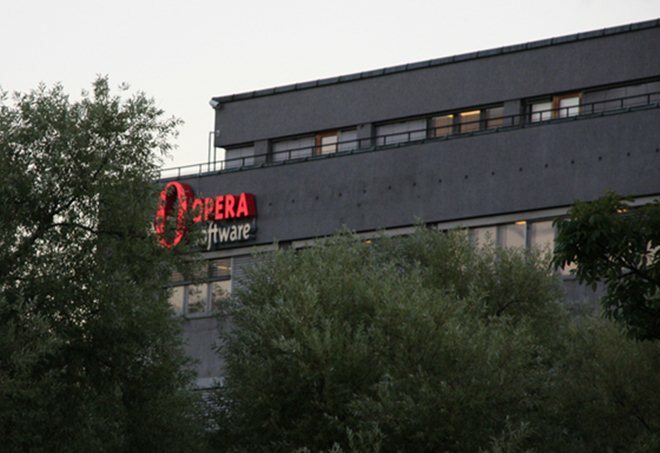 Existing metrics often come up short — as we’ve discussed before — but Opera’s mobile browser was used by 208 million phones worldwide during July (up from 200 million in June) and emerging markets are a particular stronghold for the Norwegian company. Finally…no, before you ask, there’s no update on the rumors that Facebook is eyeing Opera and, yes, this report is another example of the reach and benefits that Opera could provide the social network in emerging markets.